Here’s how to check if you or a Facebook friend were connected to the “This is Your Digital Life” quiz, which is how Cambridge Analytica harvested data. Facebook has begun rolling out a feature to some users that will notify them if their data was accessed as part of the Cambridge Analytica data scandal. Facebook previously promised it will notify users whose data may have been utilized for political gain. Facebook users have started seeing one of two messages at the top of their News Feed — both using the header Protecting Your Information. One message will focus on Cambridge Analytica, while the other focuses on general Facebook privacy, data, and app control. If you’re waiting for Facebook’s News Feed notification, you can visit this link to see if your information was shared. Up to 87 million Facebook users had their data improperly accessed, the social network has revealed. “We have banned the website ‘This Is Your Digital Life,’ which one of your friends used Facebook to log into. 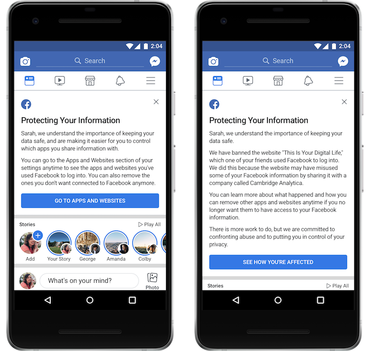 If your data wasn’t accessed by Cambridge Analytica, Facebook will link to broader settings so you can protect your information on the social network and across its vast app ecosystem. It’s been about a month since it was revealed Cambridge Analytica harvested information belonging to millions of Facebook users to determine how they may vote at the ballot box during US President Donald Trump’s election campaign. The scandal has rocked Facebook’s stock price and its trust with users. Facebook CEO Mark Zuckerberg is set to testify in front of congress this week to answer lawmakers’ questions about the Cambridge Analytica scandal. He’s repeatedly apologized for the scandal, and is promising more tools and transparency for Facebook users to protect their data. Facebook hasn’t immediately responded to requests for comment on the rollout of the “This Is Your Digital Life” tool.